The BXpanded Trenching Bucket lets you dig a narrow trench for utility and drainage installation. No need to dig a 12" ditch for a 2" pipe. 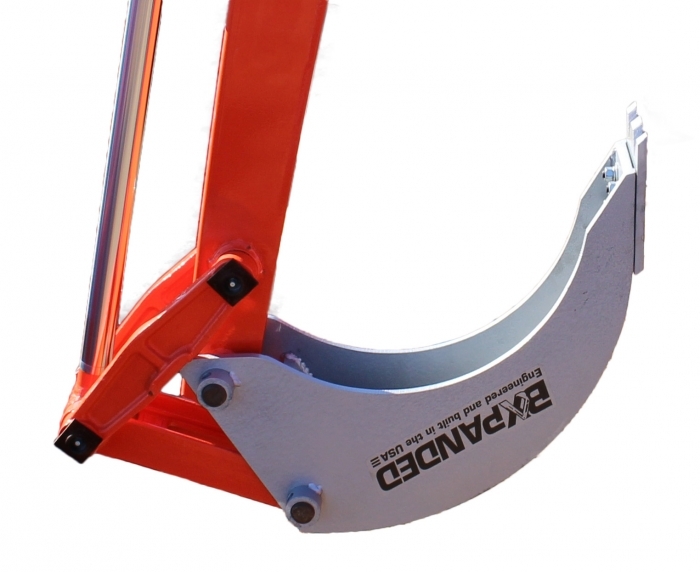 The 4 1/2" wide Trenching Bucket has cutaway sides to help with dumping excavated material. Sturdy all welded steel. It has a unique reversible edge with teeth on one side and smooth edge on the other side. Unbolt and flip it to match your bucket to your project. Installs easily on the Kubota BH65, BH70, BH75, BH76, BH77, B4672, B4672A, BL4690B, BT750, BT751 back hoes. This is fantastic. I've purchased Harry's items before. Snowplow, thumb, and many others. This is excellent quality and workmanship. Changing the bucket on my Kubota B2620 was a snap. Two pins and even with the thumb the bucket fit perfectly lined up better than the original bucket and the pins went in with no forcing. You can't go wrong with Harry's items and this one is one of the very best! Very high quality product! This fit my B2601/BH70 perfectly. Received it two days after I ordered and had it pinned to the backhoe within 15 minutes. Going from a 16" bucket down to this one for trenching I found it sliced through roots with ease and after 100' of trenching it shows zero signs of wear (even the stickers are still like new). These guys build products to last!